New nylon webbing reef nettles. I've always resisted getting "yacht" grade hardware for my little plywood boat, but I've learned that sometimes the expensive stuff makes your boat far more seaworthy than the cheap stuff. 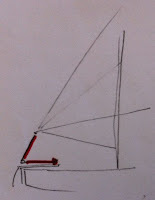 For twelve years, I sailed Cream Cheese with the simple mainsheet arrangement shown on the plans. Then in March, I modified the rig to bring the sheet forward. 2. 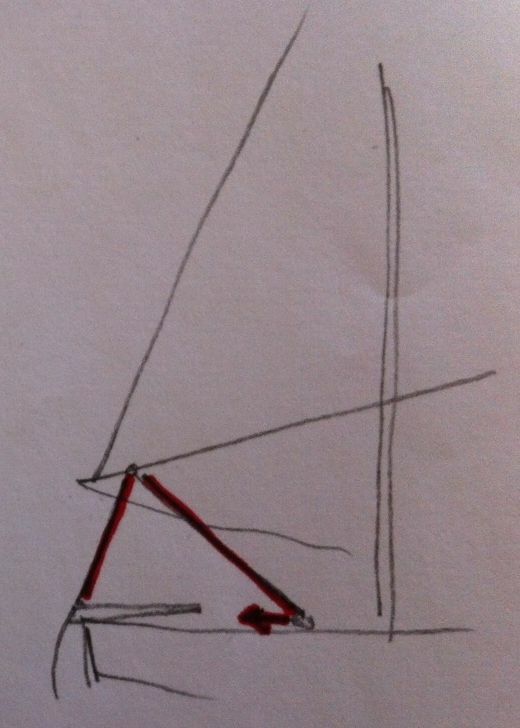 Mainsheet was tied to a combination block/jam cleat forward. This holds the mainsheet too firmly. It was too difficult to release during gusts. 3. The mainsheet gets in the way when you are coming about. 4. 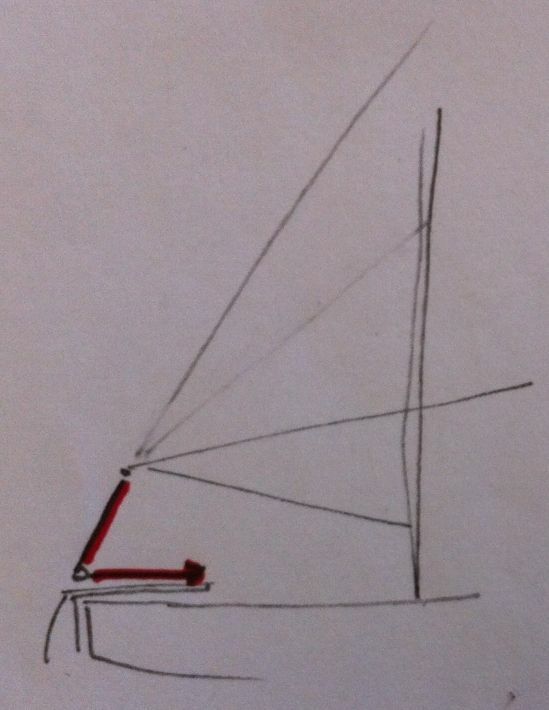 Running the mainsheet through a block on the base of tiller creates an awkward weather helm. 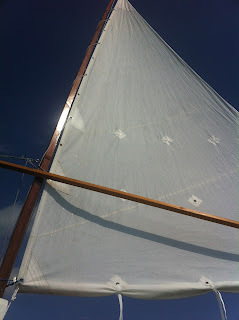 So I looked at the mizzen for the Core Sound 20, which has about the same sail area and the same position in the stern. 1. 3/8" line. Easier to handle in strong winds, lays better in the cockpit. 2. Standup blocks on either side of the tiller - no extra forces on the tiller. 3. Cam cleats - super easy to set or release. Much safer in gusts. So I went to defender.com and bought some expensive hardware and 50' of low stretch line. 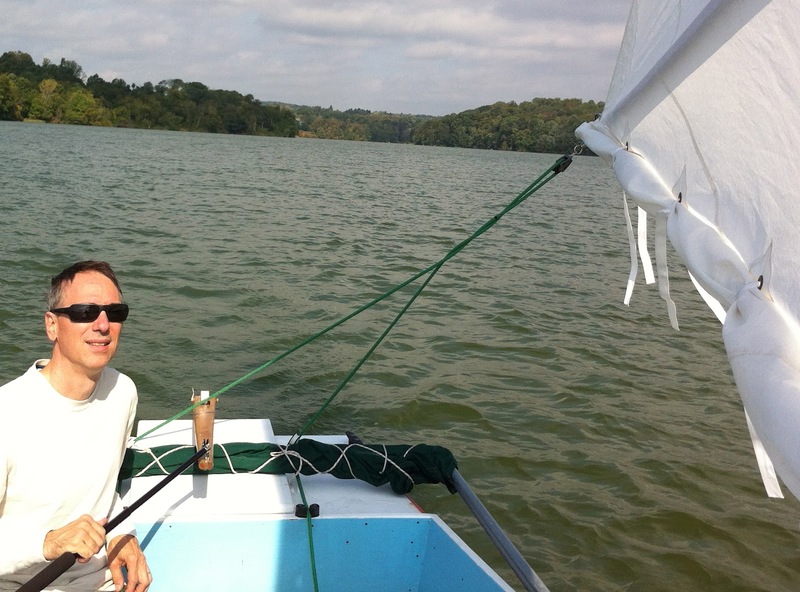 I tried out the new mainsheet arrangement today with more gusty winds. Wow- what a difference. Even Julie, who is doesn't usually like sailing in gusts, was very comfortable at the helm. New main sheet - I'll fix that twist later. Leeboard repair - the "rope trick"